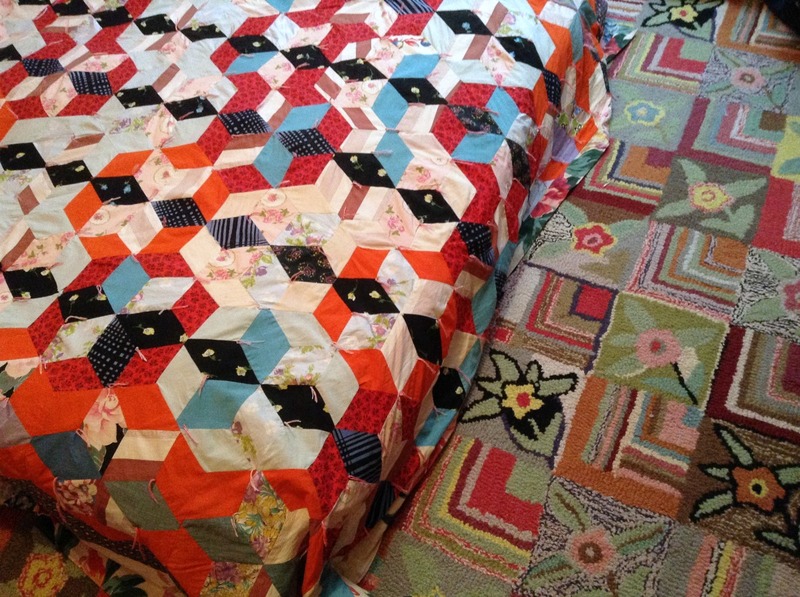 Technically this is a comforter, not a quilt, because it’s tied, not quilted. I think it has an old woolen blanket inside for the batting. It’s surprisingly heavy. The shipping cost nearly as much as the quilt. Are they tumbling blocks? Big stars? 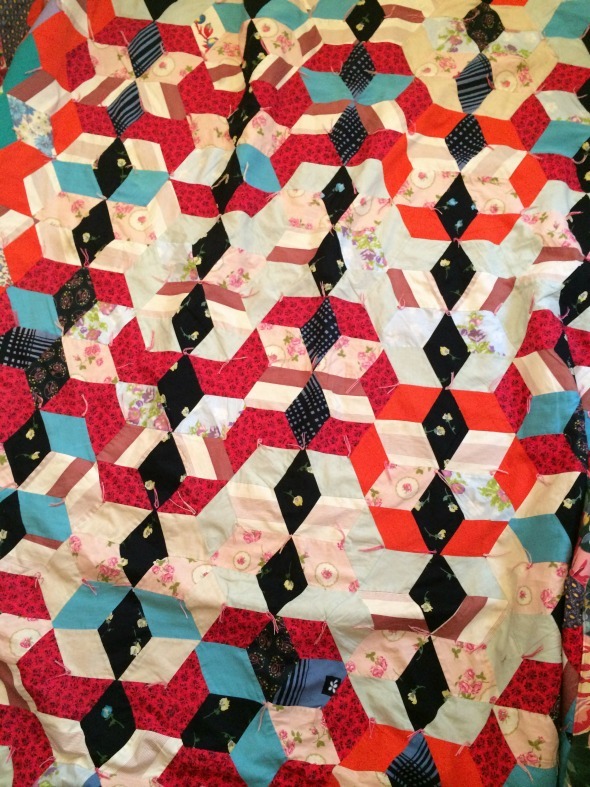 Pieced hexagons? My brain can’t decide. The fabric on the back is what really sold me on it. I love a huge floral! Maybe this was curtain or upholstery fabric. 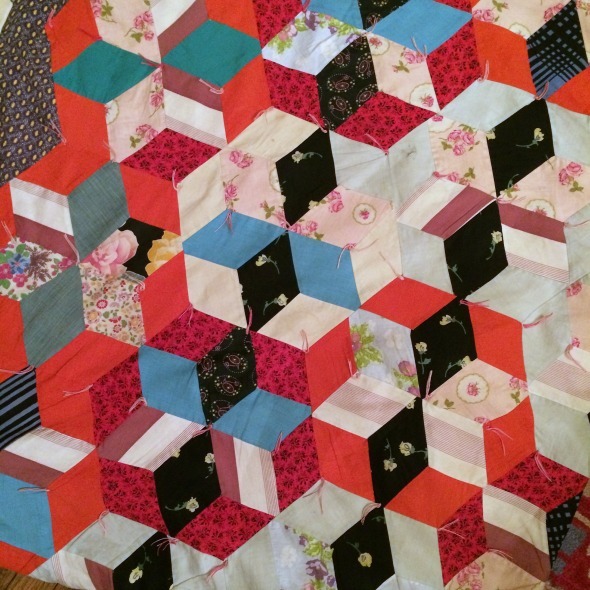 The colors are great with the patchwork on the opposite side. The description said something about “needs cleaning” which is just a euphemism for “smells manky,” because it wasn’t dirty. I don’t think it had ever been used–the fabric was crispy and clean except for the musty attic or basement odor. I suspected the smell was coming from the blanket used inside as batting. 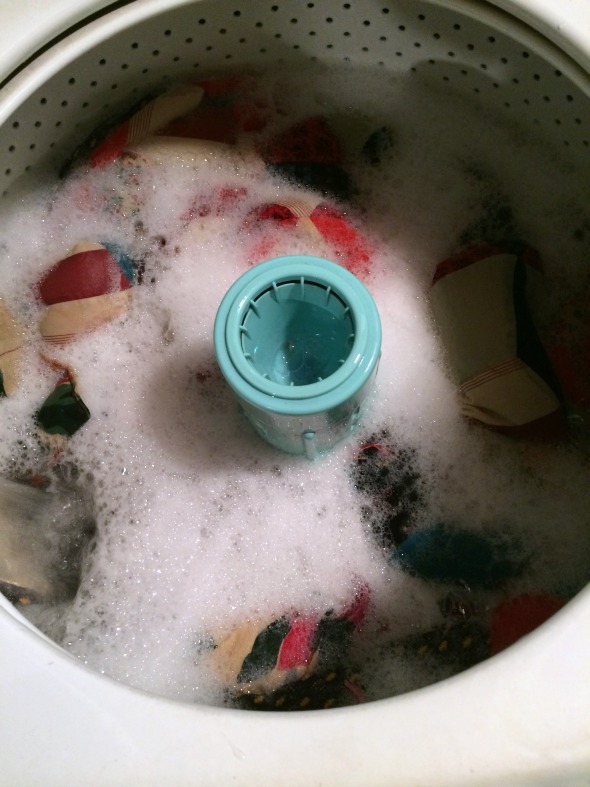 I dumped in a heaping cup of baking soda and a small amount of detergent into the washer as it filled, then added the quilt. I let it soak for a few hours, then spun out the water and refilled the washer with plain water. Rinse, soak, repeat! Rinse, soak, repeat! It took about five additional soaks in plain water before the rinse water was running out clear. I added a heaping cup of white vinegar to the sixth and final soak. The musty smell was nearly undetectable at that point. I know line drying is hard on seams, but it’s my only option. 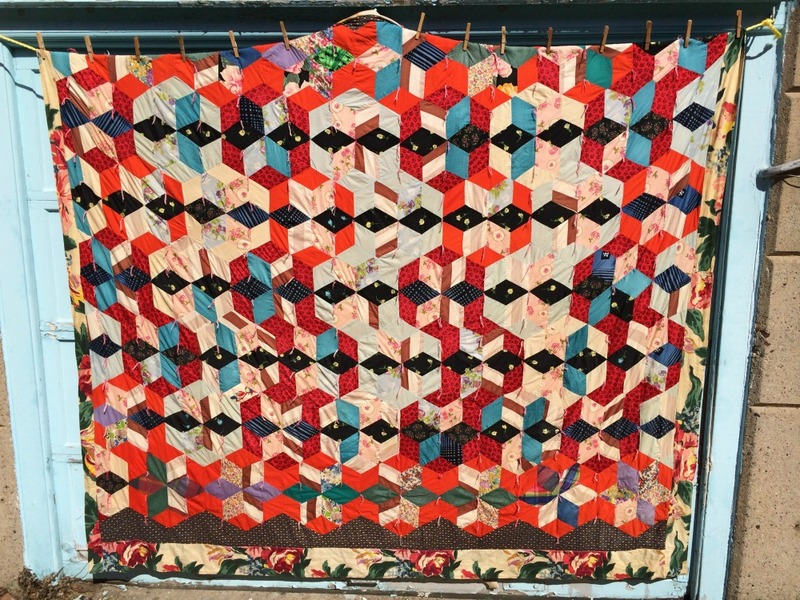 I don’t have a yard big enough to spread out a quilt. I don’t even have a proper clothesline. After a day in the air it was smelling as fresh as anything can get here in the city. It was ready to meet the guest room. You’ll just have to imagine the deep red walls and orange velveteen curtains! 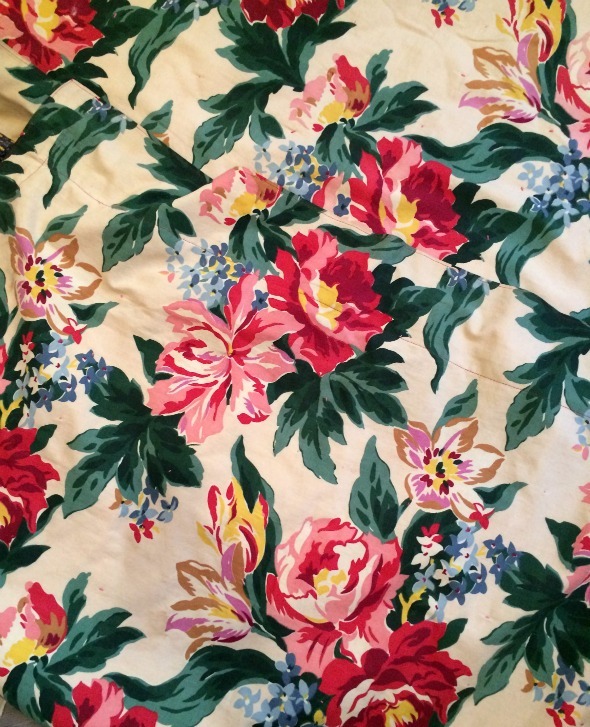 Ilona, I used to have a whole bed set with that floral print. I still have the sheets, but I think I sold the comforter at a garage sale! It’s a fantastic print! I can see why you’d hang on to it!